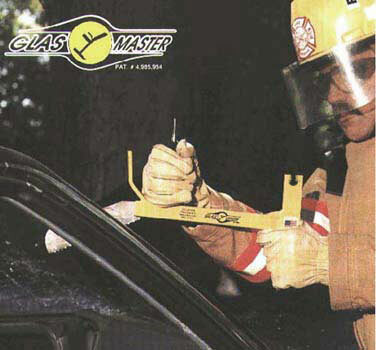 The extrication tool for vehicle glass removal. Wehr Engineering located in Fairland, Indiana has developed this revolutionary GlasMaster tool to expedite the removal of all glass, reduce the risk of trauma to the patient, and provide increased rescuer confidence in safely tackling this task during an emergency. The presentation of information contained in this page is © copyright MCMXCVI Wehr Engineering. The Glas-Master tool is protected by US Patent # 4,985,954. For further information on Intellectual Property matters contact Wehr Engineering.